These high quality folding steps are commonly used by painters and decorators who need an easy to use but durable piece of access equipment. The steps comply to BS2037 class 1 standard and are made from Aluminium, so they are extremely strong yet light enough to be easily carried. 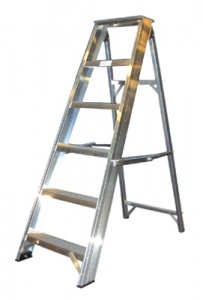 Whether they are being used by tradesmen on-site or by home users they provide the perfect way to access those hard to reach areas. The simpler design of these painters steps makes them easier to erect and collapse down than platform steps - essential when you are working your way round a room with the paintbrush! Available to order in a full range of sizes from 3 to 12 treads.